Let's go make some fantastic Chicken Souvlaki! Extract lemon juiced into the bowl. Add a little olive oil (1/2 of the volume of lemon juice) and beat it 'til it is entirely blended into the lemon juice. Gradually add more olive oil, beating it alternately, until the lemon juice/olive oil mixture is canary yellow. Add finely minced (or grated or crushed) garlic cloves, salt, rubbed oregano and basil (or finely minced if fresh), and ground pepper and blend. let chicken marinate for 24 hours - stirring occasionally to assure that all pieces are exposed to the marinade (be sure to allow your chicken to marinate in the refridgerator if marinating for more than an hour, ie, overnight). If you do not have 24 hours to marinate the meat you may stab it with a fork to encourage the meat to absorb the flavours of the marinade more quickly. 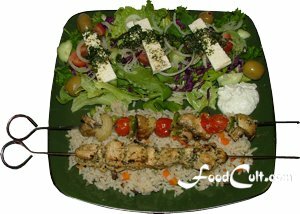 Souvlaki is best cooked on a grill but skewers may be broiled as well. The first time we tried souvlaki, it was lamb. It was served as a heavenly, perfectly balanced sandwich of expertly grilled lamb, with a bit of salad and awash in a delicious, rich, garlicky tzatziki. This recipe is based on two chicken breasts but is designed to be easily adapted to any number of portions you wish to prepare. No special tools are required except that sufficient skewers are needed. 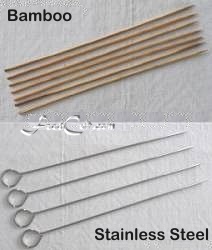 pros: Bamboo skewers are disposable. You don't need to worry about damage or bending because you know they're not designed to last. Bamboo has an organic kind of charm. They can look nice on a plate. Turning the food can be difficult. Because the skewers are round, food may spin on the skewer when you try to turn it ... and there's no handle (nothing by which to grip the skewer). pros: Metal skewers lasts for ever. They have a flat side so turning food with a metal skewer is nice 'n easy. They are long and hold a nice amount of food (they will certainly hold an entire diced chicken breast). Removing food is easy (at least in part because of the handle). cons: Metal skewers get hot so they are not a pleasure to handle while cooking. They don't look nice on a plate. Make Your Own Pita for the most amazing Chicken Souvlaki Sandwiches EVER!